The vegetable samosas had a thick crispy pastry and were not oily. I’m not quite sure what the filling was but it did contain cashew nuts. The samosas were good and it made a nice change to the usual potato filled ones. They were served with chickpeas in a tasty sauce. The dahi puri were great little balls of puff pastry filled with tangy yogurt. They were topped with pomegranate seeds. This was a cold starter dish. We had no complaints at all with the grand vegetarian thali. This is called the balanced meal and it consisted of little bowls of different curries and accompaniments. It was a really good selection of dishes. 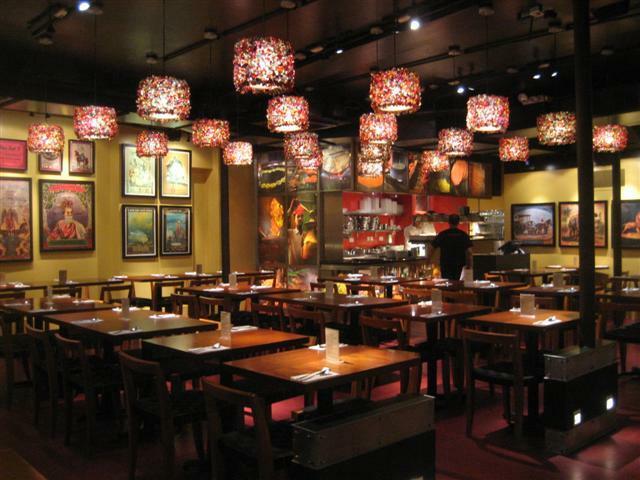 It was great as you were able to taste a variety of dishes altogether and it was surprisingly filling. We got to choose the two main curries of the thali. I preferred the Gujarati dish of undhiyo and lentil khichdi. This was made up of sweet potato, purple yam, baby aubergine, raw banana, val dal and snow peas. It also tasted like it had some coconut in it. The second curry that we had was paneer makhanwalla which was paneer in a creamy tomato sauce. It was ok but not outstanding. The other items in the thali were aubergine pakora, lentils, cauliflower curry, spinach and potato curry. It said on the menu that those dishes are changed daily. The lentils and cauliflower curry were particularly tasty. The final touches to the thali were rice, chapatti, raita, salad, poppadom and chutney. It was all nicely presented. The grand thali was definitely enough for two people although the staff said that it would be just good for one person. The chapatti tasted homemade and very fresh. It was also perfect as it was made from wholewheat. The thali only contained a little bit of chutney and kachumber (salad). The Indian canape was just one piece of pakora. Saying that, I would still highly recommend the thali for the main meal. For dessert, I had the falooda. This was a sundae made up of strawberry ice cream, pistachio kulfi, vermicelli and milk. It was a very rich and creamy dessert. Falooda is traditionally served in tall sundae/milkshake glasses and it also usually contains tapioca. Masala Zone served the falooda in a dish. When we asked the waiter about this, he told us that they used to serve it in tall glasses, but then customers told them that it was not easy to eat from such glasses. So that’s why they changed the way that they served it. 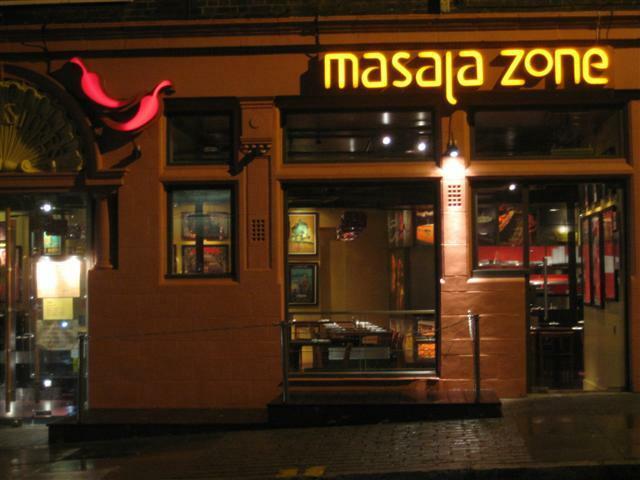 Masala Zone have a range of hot and cold drinks. One of the things that we were intrigued by was the masala coke. This was coke with added spices; not something that I would have again. The orange and mango juice was a lot nicer. They also do masala chai – a milky spicy sweet tea. This restaurant had quite an individual feel to it. 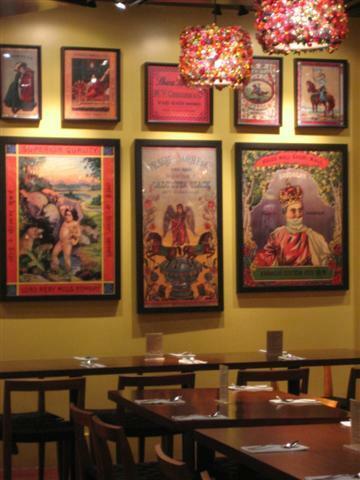 It had quirky decor with lots of retro posters on the walls. There was the open kitchen at one end of the restaurant. The staff were really friendly, helpful and efficient. We experienced great service with a smile. It was nice that at the end of the meal, the waiter asked us if there was anything that they could improve on with the food. We told them that the dahi puri’s pastry balls were a little soft due to the yoghurt and we would have preferred to have them crispy. The waiter said that he would mention that to his manager. It felt like Masala Zone does value their customer’s opinions.